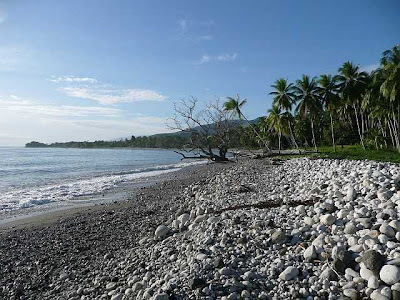 The Malasanga coastline looking east toward Welowelo. The bugada coastline on a gorgeous day. This coastline suffered damage during the December king tides. I like posting funny photos of things found in stores. 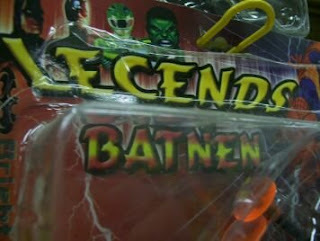 note: batman, daredevil, a power ranger, the hulk, and spiderman. I'm not a comic fan, but I believe some of you may be able to tell there is a mixture of DC and Marvel there.. along with a power ranger. It's always fun to see what you'll find. Okay we're all booked for travelling to Menapi for this Bible Dedication. I thought it might be helpful for you to see what we're doing. Ukarumpa and Menapi are maybe 100 miles apart. But there are no roads. So the only access is via fixed wing plane to an airstrip and then from there a helicopter shuttle. OR you can travel commercially fixed wing and then take a boat. 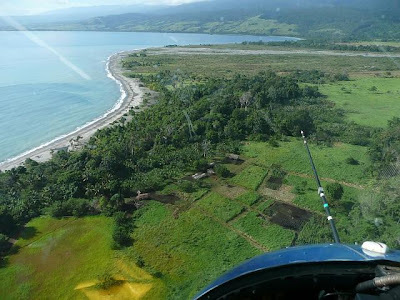 Since our only boat is in Alotau, we are flying into Alotau and then taking the boat. Roads: - the roads are anywhere from paved full of potholes to dirt and possibly you find out half way through they are washed out. We (a van of 12 people) drive 2 hours to Goroka on mostly paved roads, curvy and typical third world main highway type road. 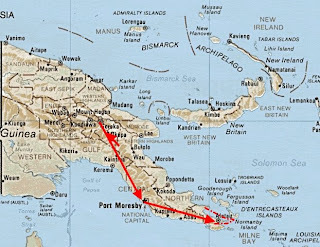 From there we all hop a commercial airline plane and fly 1.5 hours to Port Moresby. From alotau we get picked up and drive the road to the centre. REst for the day. From there the women and children take a fixed wing aircraft to the other side of the country while us men take a boat 7 hours across choppy seas, around the cape. There WAS a road straight from ALotau to the other side of the cape, but it washed out. That road would have taken us an hour to drive, and saved us 7 hours on a boat. After we arrive, we'll celebrate and have a ceremony and sleep on the hard ground or possibly a village house floor, and then the next day get back on the boat and travel back. So, travel wise, we're looking at a VERY long route to get to this location, which I hear is gorgeous. Me and my friend are of two minds on this. He keeps saying "it's great adventure, we'll get sick, it'll be GREAT"
I keep thinking "oh boy, 15 hours of seasickness is gonna put me in a great mood to sleep on the dirt. I'm gonna be too tired to enjoy the ceremony." -calm seas, good travelling, that I'll have a good attitude. It's an adventure and like any adventure, you need to have a good attitude. Personally I wouldn't blame anyone who called me crazy. Because of all the travel we're paying a handsome sum to do this too. So that's a possible double whammy on my attitude. Each time I'm bending over the side of the boat I have to think "yup I'm paying for this." hehehe. -skill - I'm going to be in charge of video documenting the event. A tricky task because I'll need batteries and won't have any way to charge them, so I'll have to conserve my power and use it wisely. -finances - it would be nice to have this trip paid for before we get on the boat. Thank you all so much, and if you ever want to come visit us, give us plenty of notice so we can plan an adventure for when you're here!!! A dedication is the celebration of the fruition of a team effort. As we travel there, it's like we're taking you all with us. I'm going to have a video to show you, it should be a GREAT time! Well I suppose since I just shared a success I should share a failure. For a long time in my career I have been able to say "I have never had a large data loss." I've always been extremely careful about backups and double backups. But mostly however, that was on unix systems where duplicating disks and running raid was my cup of tea. This weekend our major corporate email database (microsoft exchange) was corrupted while one of my co-workers tried to restore an inbox. After 8 hours of work and database recovery, I was able to restore ALL previous email but 2 days worth. Still, 2 days worth is serious data loss to me. Fortunately, out of the 600 people on centre, only about 5 people thus far have actually experienced data loss because most folks were running in Cached exchange mode. I have not experienced any key people... so the data loss isn't HUGE.. and so far nothing vital was lost. I've even had people say "hey I love it, now I have a scape goat.. I can say 'oh sorry I haven't worked on that, you must have emailed me during the 'blackout'"
Still though, this weekend was a time for me of pondering if it had been better I didn't even wake up this weekend. I know my value here, I know God put me here, but it doesn't mean everything I do will be a raging success. This data loss, while minimal, was the largest data loss of my entire career. I guess that means I've had a blessed career. I think the sting is a little harder because my customers are also neighbors and if they feel an email loss, so do I. Formerly if I had down time like this, it would have been costing us millions of dollars, and so working here for me has been less stressful than working for a big corporation. I did learn this weekend though, that I need to constantly be vigilent. The entire error happened because I was very very busy handling 3 emergencies and someone asked "Hey Chad should I try this." and I said flippantly "yes" without thinking through the consequences. I think from now on, I'll be more realistic about my abilities and try to be more cautious. I think handling 3 emergencies isn't a time to be answering questions I'm not entirely listening to. I praise God! During the outage I was praying "God please, let the only person affected by this be me, let me pay the cost for my mistake, not everyone else working here." -If I hadn't split the email servers to home/corporate 2 months ago, this loss would have affected more than twice the amount of people. -Cached mode saved most emails for most people. -You've learned a valuable lesson from this. Yes I am humbled today. It is a good thing to be humbled from time to time. And I personally LOVE that God doesn't seem to let me get out of check. I constantly pray that God would not let me think that what is done here is of me, but instead of Him. This weekend could have been HORRIBLE but instead it was only bad. That's a huge reminder that the skills I have are from God and my attitude should reflect that. It was fun being a hero last week, but it was also enjoyable in a different way, to watch God be the hero this weekend. Part of living here is losing power. We have a massive generator system which helps us maintain security lighting and power to our homes. However tomorrow we'll be undergoing a full day's outage to upgrade the generators (which we are very thankful for). As a result I'll be working most of Saturday to keep the servers offline so they don't over heat. "Dear God, thank you for all the wonderful things you've given us, like blue skies, and birds and water, and power, even though tomorrow we won't have any. But it doesn't really matter because I'll be outside all day at a mumu. Amen." Today was a really tough day at work. The kind of day where you come home and really want to find out your kids were well behaved. Well my daughter misbehaved a bit and I had to send her to her room. She had moved something of mine that I had told her not to touch. So I sent her to her room "please do not touch my things." and she replied "well dad, I didn't mean to touch your laptop." 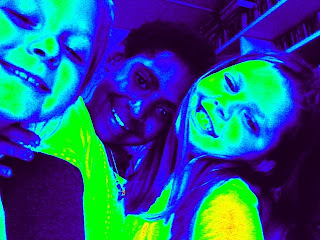 well I didn't KNOW she touched the laptop, I was talking about something else, so I opened my laptop, and apparently for around an hour or so, my daughter and her friends were playing with Photobooth on my mac. I'm watching this video not sure to be mad or laugh, and I see my daughter touching all kinds of things. In one video she's playing my banjo and mimicking me. So I call her in. "While you were in there did you touch anything else?" So we have a serious problem now, see, she wasn't silly enough to confess to anything she didn't have to, but she was silly enough to video record herself breaking the rules about my banjo. We had a talk about trust, and now she's not allowed in my office. Meanwhile I'm watching these videos laughing with my wife, and definitely burning these to DVD. THESE babies are coming out when the kids start dating. "photo albums? No... I wouldn't show you photos of my kids when they were younger..... no.. I HAVE DIGITAL!!!! Here, I'll upload this video to your phone." from time to time days come up where you get to be someone's hero. I personally relish the days where my talents can enrich and help someone else in this way. Yes what we do here helps Bible translation. But occasionally it also saves someone's day. My wife and I have a little joke, when I get home from work she says "did you save the day again today?" In the past 24 hours I have been a hero twice, and it isn't a pride thing that makes me feel good. It's the fact that I can serve and help someone else that makes me feel good. To be of use, to be helpful, to be able to fill a drastic need. Yesterday the principle of the primary school was having a REALLY bad day. I won't go into it, but it was simply everything going wrong. I was in a unique position to help. One of the things that went wrong was her laptop stopped booting. It took me about an hour of running chkdsk /r on her laptop and it was up and running. She also had several computers from the PC lab have multiple problems. School starts in 3 days. And her computer lab is in a shambles. So our team of crack computer experts swarmed on the situation and have been working to repair it. We saw the look in her eyes that day, man was she spent. So Kendal and I invited her over for left overs. While we were eating dinner, 2 friends stopped by, so we said "grab a plate". Suddenly our nothing planned evening became a left-over buffet and a great meal with friends. I get a call from one of the top managers here, that their laptop was stolen in the capital city. So I had to scramble to check data backups and inventory information to help the police recover. Today I came into work and the corporate email database (exchange 2007) was down. So I've been repairing that so that people can get back to work. It's been 24 hours of heroic activity. Perhaps it's my years of doing this now, but I recognize that God has put me here and given me these talents to use them to bless others and I really feel good when I can be useful that way. So, it does feel like being a hero, but it feels more like being put in the right place at the right time by God, with the right skills He positioned me to learn. There is something so very satisfying about that, so very peaceful about knowing without doubt that you are where you are meant to be. This picture is of the delivery of the Iyo New Testament. The village is the area of some of our friends who will be dedicating soon (although we will not be able to attend as we are attending ANOTHER dedication). 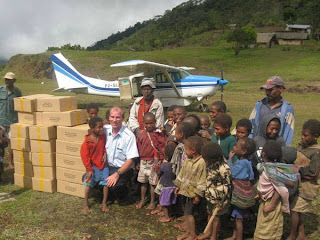 The Cessna 216 you see here was able to carry all of these Bibles in 1 trip with 2 pilots. One of the many ways I supported this particular delivery is by maintaining the systems that allow the pilots to move about. Aviation has so many technical requirements, tracking, communication, booking, shipping. All of which take computers, radios, gps systems, and complicated software to maintain. I lend technical assistance to Aviation by helping the guys there who maintain their software. Kendal teaches the kids of the pilots and the translators. In fact Kendal had the son of these translators in her class. I love these types of pictures, seeing a box of Bibles in a village represents a huge team effort. You are part of that team by allowing us to be here. we have been planning for months but could not get substitutes to cover for Kendal so we're a little left out in the cold. IT's okay. Booking commercially is cheaper. But definitely more difficult. There are times when you are hit in the face with the fact that you live in a third world country. For example. I booked the flights for all four of us to go, on 2 legs via a web page. The web page was poorly designed but saves us the 3 hour trip into town. When it's all said and done... this is the result. -The kids aren't booked on the flights we are. -They can book the kids on 1/2 of the flights. I try to explain to them that my kids can't meet us half way. IT takes some effort to explain they are 8 and 9 and unable to fly across the country unsupervised. Finally I get them to commit to letting my kids on, but I have to pay some sort of extra fee. "Most countries do not react well if you begin to get upset when dealing with them. Remain calm." In America you ask for a supervisor, express your frustration politely, and expect results. Here, if you do that, you get no results. So I remained calm, on the phone and very very thankful for that education I received years ago. IF you can pray that we all get to the dedication and back... relatively together, I sure would appreciate that. The enemy doesn't want us to go on this trip. Our friends are having a hard time getting their infant on the trip as well. Praying that we get there, and that God is glorified. WE truly want this culture to be changed by the Gospel, and this is a part of that process. This is going to be a saga. It will encompass not 1 post but many posts. Some friends of ours are dedicating a New Testament in a Gapapaiwa village. To get there we need to take a car to an airport. Take a plane to Moresby. Hop a plane (hopefully same day) to Alotau. From alotau my wife and kids will take a Cessna 216 fixed wing across to a landing strip and then a shuttle helicopter over to the village. I, along with other husbands will be taking a boat. The Kwadima II. This boat ride will last 14+ hours over choppy seas. The amount of detail in planning this trip is enormous as you can imagine. Add to that we really don't know where we're going to sleep until we arrive. 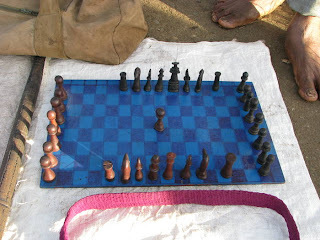 It most likely will be on the floor of a village house. This is by far the most stressful and detailed adventure we've had yet. Trying to get not all 4 of us there, but 2 families there in conjunction with a whole bunch of other people going to see this big dedication. I have been commissioned to shoot video and help with any computer needs along the way as well. So it is not a vacation. The end result, is that we hope to have a very nice video to show you all of what an Island location dedication looks like. 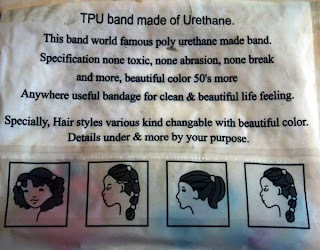 In living here, from time to time you run across a fun piece of English translation on an item in the store. For many of us it has become a game. Find a hard one, then email out the text and then the others try to guess what it could possibly be. Believe it or not, this is one of the more obvious. 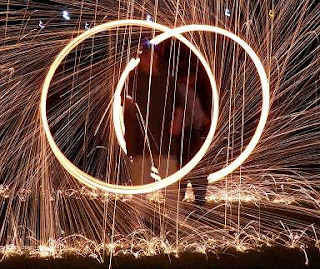 These pictures are what you see when you light steel wool on fire and then swing it in a circle from a chain. For the fourth several of the Americans bunged (came together and shared food) on the grass to celebrate. We sang the national anthem, we saluted the flag, we ate hot dogs and we had home made fireworks. One of the guys from the auto-shop filled balloons with acetlyne gas and that made a nice BOOM. I was able to launch a couple of flares from an old emergency kit. Kids had glowing bracelets. It was like a normal 4th block party. I think one thing that makes me appreciate our celebrations so much is that they aren't instantly put together. In order to make something "special" it does take anticipation and planning. And not everyone is a planner, so those of us who do plan tend to bring a little EXTRA for those who don't. It was our great privilege to give glowy sticks to the younger kids who can't handle the sparklers... makes us feel like Uncle and Aunt again. We picked them in in Lae about 7 months ago when we found them and held on to them this long. I love to jury rig stuff. I hate to put jury rigged stuff in production. That said, a while back we had to get creative. We back up our linguistic information (and other stuff) to tape. This requires 5 x LTO3 tapes a weekend. One day we dismounted the Djell Powervault 124t jukebox from the rack to dust it out as our server room gets a lot of dust in it. Sure enough suddenly the left side of the vault wouldn't work any more. These tape vaults store 8 tapes on the left side, 8 on the right. We had no backup tape drives, and no way to do backups if we didn't get this working. After poking and prodding around, one of us discovered (I think it was me, but it was a while ago, it may have been one of four guys) that the LEFT side of the jukebox was technically identical to the right side... except for the plastic face frame. Well, a few loosened screws quickly swapped the faceplates, and then, we were able to fully use only 1 side of the jukebox (which defaulted to loading into the side that was broken).... with the jukebox fooled into thinking the broken side was simply not used, we were able to do backups that night. Since then we have a stand alone drive for emergencies, AND we have a SAN so we store to DISK first then to tape. So a nightmare scare like not being able to backup, shouldn't happen again. It's that kind of thinking that really excites me... finding out how to fix a problem with what little resources you have on hand. I LOVE that, but again, I wouldn't want to support something that was pieced together all the time.. so we do go back and fix it. the Jury rig should only be an emergency and temporary solution.